The blockchain does one thing: It replaces third-party trust with a mathematical proof that something happened. Immutability – A third party cannot make changes to data its all public and replicated at multiple nodes. Corruption & tamper proof – Apps are based on consensus-based and hence censor-proof and governed by mathematical laws. Some of these are great advantages creating decentralized systems also comes up with its own set of problems and one of the biggest problems decentralized systems have faced is Scalability. 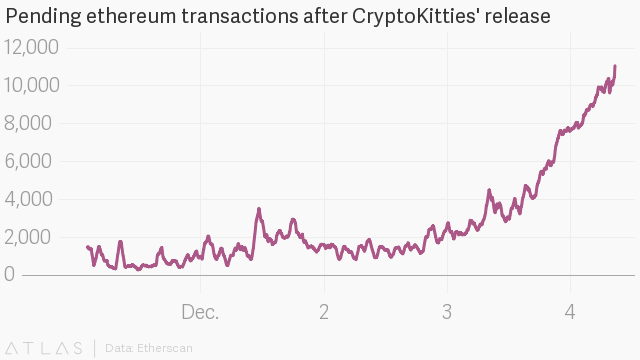 The belo graph shows how Ethereum pending transactions shot up when a viral Ethereum DAPP Cryptokitties got released, Just one viral app brought the system to its knees. So to support multiple commercial apps on the network Public blockchains have to scale multiple times from current levels and not just scale they have to scale in a way that transaction costs remain affordable, we do not just want decentralized Visa but we want decentralized Visa at lower costs. Tomochain wants to mainstream decentralized consumer and social apps, and bring low-cost( free) instantaneous transactions on blockchain to solve the scalability issues and usher in a new era of decentralized consumer apps. Below is the basic flow of How Tomochain plans to go about creating a blockchain for Distributed consumer apps. Proof Of Authority (POA) to build consensus on different nodes. Tomochain is following a different approach to building the blockchain network.They are building first a consumer side app TomaoAPP It is a social question answer app basically a Decentralized Quora . So essential Roadmap for Tomochain platform is opposite how ethereum or other blockchains got built they are starting with an APP and then building a network which supports these APPs and fast transactions followed by a wallet and set of API’s. Erstwhile co-founder and the former project lead of NEM blockchain (New Economy Movement). Son Nguyen : Chief Technology Ofﬁcer, Director of Engineering of Tomo app. Experience Blockchain leads developer founder of the Blockchain Developer group with more than 700 developers. Minh Chu is Blockchain and Product Leader, Chief Cloud Architect of VCCloud . Security expert.